The church: Trinity on the Green, New Haven, Connecticut, USA. The building: A 19th century Gothic Revival structure, built out of the brownstone commonly found in this part of New England. The interior is dark yet very colorful, with green and red covering the ceiling and pillars. The east window depicts the Trinity via a medieval-style diagram showing three circles with links between them. The church: Trinity Church is at the center of New Haven, right across the green from Yale University's Old Campus. It seems like many students make Trinity their home church, and the parish is famous for its strong choral tradition (go to their website and you'll be greeted by a recording of the church choir). The neighborhood: New Haven was founded in 1638 as a grid of streets around a common green. The Puritans envisioned the green as symbolic of the centrality of the Christian faith to the colony. Besides Trinity, there are two other churches located on the green. The city has long outgrown its original plan, but the area around the green stands as a quaint reminder of life in a simpler, quieter age. The cast: The Revd Andrew E. Fiddler, rector, was the celebrant, assisted by the Revd Estelle Webb, associate rector, as deacon. The Revd Alex Dyer, assistant rector, was the preacher. The date & time: Sunday, October 21, 2007, 5.00pm. 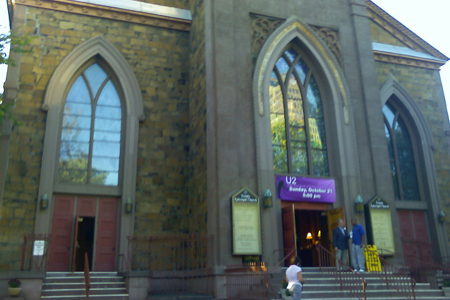 "U2charist" – Holy Eucharist and the music of U2. I wouldn't say bulging at the seams, but every pew had at least one occupant and the gallery was in use. This was a special service, so it's hard to judge what regular Sunday attendance must be like. Yes. A tall young lady gave me an order of service, asked me where I'd like to sit, and then ushered me to a pew. Yes, I found it very comfortable. There was a substantial cushion on it, which certainly helped. Every pew had a door which you could lock from the inside – which might explain why I was alone in my pew. It was rather chatty, with a few noisy babies and toddlers. I got the impression that a lot of people had traveled from neighboring communities to come to this service – they were talking among themselves and getting to know one another. "Good evening. My name is Alex Dyer and I'd like to welcome you all." A specially produced order of service included all the liturgical bits and song lyrics we needed. The liturgy was taken from the 1979 Prayer Book. I also spotted a 1982 Hymnal in my pew – I guess they use that in their more traditional services. A professional U2 tribute band called 2U played guitar, bass and drums, with a gentleman calling himself Boneaux, impersonating U2's lead singer Bono, providing vocals. There were also some keyboard sounds, though I couldn't spot the instrument producing them. There was a girl in the front row who was dancing freely, boogying with the music as if she were at a rock concert. There was something about seeing this in a neo-Gothic Episcopal church that was both amusing and very distracting. Also, Boneaux walked among the congregation during the final song, shaking hands with the people like a true rock star. That was exceedingly distracting – I don't come to church to meet performers, but rather to worship God. The U2charist has become a staple of Protestant worship. Basically a traditional service, it uses the music of U2 instead of traditional hymns. We were encouraged to sing with the band, although I noticed most people were simply standing and listening. It was loud, but very well played rock music, and I'm a fan of the band. A couple of people were raising their arms, swaying with the music, and most people were doing the shuffling-from-one-foot-to-another dance (including the clergy!). 7  Assistant rector Alex Dyer is a very good communicator. The standard U2charist sermon urges the congregation to rally around God's call in the Millennium Development Goals promulgated by the United Nations, so he was a bit constrained in his choice of subject matter. The church has done wrong in the past, but now we're changing. Bono can teach us a few things about Christianity, and he supports the Millennium Development Goals, which the Episcopal Church also supports. Bono reminds us that God is with the poor and the helpless, and that God calls us to work for their good. Being a fan of U2, it was lovely to hear their music played live. Their song entitled "40", based on Psalm 40 ("I waited patiently for the Lord; he inclined to me and heard my cry"), was my favorite song of the night, played in place of a psalm. It's one of the few U2 songs which is explicitly addressed to God, and it felt quite worshipful. I'm very high church in my sensibilities, and as an Anglican I believe that communion should be offered to baptized Christians in good standing with their own churches. So when the preacher and celebrant both announced that all were welcome to receive the eucharist "regardless of where you are on your faith journey," I had a moment of real existential angst about whether I could assent to that theology and, consequently, whether I wanted to receive communion. The tall young lady who had ushered me to my pew asked me, in passing, how I had enjoyed the service. I also had a brief conversation with a fellow visitor who'd been sitting behind me. But most of the congregation simply beat a hasty exit, so standing at the back of the church I just felt like I was getting in their way. Eventually I wandered over to the snacks which had been prepared for us. The coffee I can't speak for (I prefer tea, which didn't seem to be available), but I sampled some tasty kettle chips and fruit. Yum yum. Paper plates and napkins were provided. 7  I'd have to sit and think about their eucharistic theology for a bit. Obviously the U2charist isn't typical, but I felt uncomfortable about the apparent lack of balance between performance and worship. 2U are performance artists, not worship leaders, and I wasn't sure that the organizers had fully appreciated the difference. Sort of. I have to say that it was very odd to be at a worship service where so little of the music was explicitly Christian – we sang about love coming to town, about being one blood, about beautiful days. But most of the music (with a couple of exceptions) didn't explicitly worship God. To be honest, it made me more glad to be a U2 fan. There was one particularly amusing and bizarre moment during the service. The song at the offertory was "I still haven't found what I'm looking for." Throughout this song, all three sacred ministers held high the offertory plates and the eucharistic elements, shuffling and singing along with the music. I couldn't help wondering, "Just what are they looking for? A hundred dollar bill? Better quality communion wine?" I wasn't sure what kind of statement they were trying to make!